Urn the knob to make the blade will gently widen until the mount holds firm. 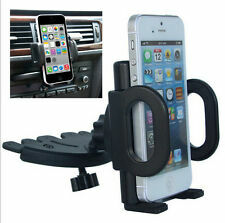 Universal 360º Rotation Air Vent Car Dash Mount Holder Cradle for Smartphone. This Car CD Slot Holder installs directly into CD player slot or in the grooves of your dash. Installs directly into CD player slot or in the grooves of your dash. Unique ball joint design and 360 degree adjustable ball joint connection can get the best view angle. Simply inserts into front CD player slot, and twist bottom screw to apply enough pressure to firmly hold mount in place. Arms designed to provide easy access to side panel buttons on cellphone. 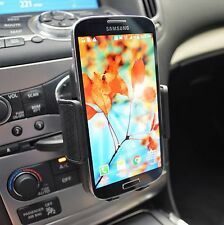 1 x Universal CD Slot Car Dash Mount Holder Dock Cradle for Smartphone Cell phone. Featuring quick - snap technology, simply hover the phone onto the holder and it will quickly snap on your device can be positioned in any desired angle. Sticky suction cup easily sticks onto your windshield securely. 1 x Car CD Slot Dash Cell Phone Holder Mount for LG V10 V20 G5 G4 G3 G6. Simply inserts into front CD player slot, and twist bottom screw to apply pressure to firmly hold mount in place. Arms designed to provide easy access to side panel buttons on cellphone. Supports your phone in the vertical position with a flip out support at the bottom. Protects your phone from scuffs and scratches with durable foam siding built in. ADHESIVE SUCTION CUP with release-lock button conveniently attaches to dashboard, windshield or any other smooth surface, will not fall off and is easily removable. 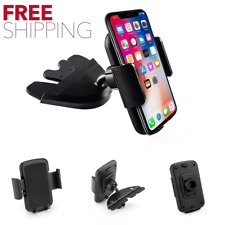 Universal Dashboard Windshield Car Mount + Suction Sticky Pad for Phones to 4"
Adhesive suction cup with release-lock button conveniently attaches to dashboard, windshield or any other smooth surface and easily removable. Keep your smartphone in place as you drive with the Cellet Dashboard/Windshield Car Mount Holder. Item model number: PHT850BK. ADHESIVE SUCTION CUP with release-lock button conveniently attaches to dashboard, windshield or any other smooth surface, will not fall off and is easily removable. Add To Favorites. This Car CD Slot Holder installs directly into CD player slot or in the grooves of your dash. Unique flipper blade design with high quality rubber made blade, makes mount grip in CD slot firm, strong and steady. 1 x Universal CD Slot Car Dash Mount Holder Mount for Apple iPhone 7 8 X XR XS MAX. Simply inserts into front CD player slot, and twist bottom screw to apply enough pressure to firmly hold mount in place.